I apologise in advance if this inadvertently proves to be a more difficult recipe than I originally intended - the basic premise is simple, but I have no idea how easy it is to obtain rounded courgettes. I'll explain - I went to the south of France with my mother a couple of weeks back, and we bought these while we were out there. Sadly, we didn't get around to eating them in France (so much food; so little time) so they got packed into my hand luggage and came home with me. The cous cous filling is a variation on an Ottolenghi recipe, and I think it makes the perfect stuffing. I made a similar version of this recipe a few weeks earlier still, where I used roasted harlequin squashes and stuffed those. Whatever squash you use, this is absolutely delicious and a wonderful way of using up such gorgeous autumnal vegetables. Couchillo olives are wonderful - smaller than normal olives, they have a gorgeous, delicate flavour. If you can't find couchillo olives, use kalamata or any other mild varieties instead. For the goat's cheese, use Chavroux or any of the ones that come in a soft log form. Preheat the oven to 180⁰C, then slice the courgettes in half lengthways. Scoop out the seeded area, place on a baking tray and season with a little salt & pepper. Drizzle with olive oil, cover and roast for 20 minutes. After 20 minutes, remove the foil and roast for a further 10 minutes. While the courgettes are roasting, pour the cous cous into a bowl, add the saffron, a pinch of salt and a drizzle of olive oil. Cover with boiling water and then cover the bowl with a lid or plate and leave for 10 minutes. Next, cook the Israeli cous cous as per the instructions on the bag, drain and leave to cool. While the Israeli cous cous is cooking, peel and thinly slice the onion, then fry slowly in a little olive oil until golden. Slice the sundried tomatoes and arbequina olives, then fluff up the cous cous. Stir in the Israeli cous cous, golden onions, sundried tomatoes and arbequina olives. Finally, crumble up the goats cheese into the cous cous mix, add the nigella seeds and roughly chop the tarragon, Stir all of these ingredients in, and your stuffing is ready. The courgettes should be just about ready at this point - test them with a sharp knife to make sure they are cooked - they should be soft and golden, but keeping their shape. 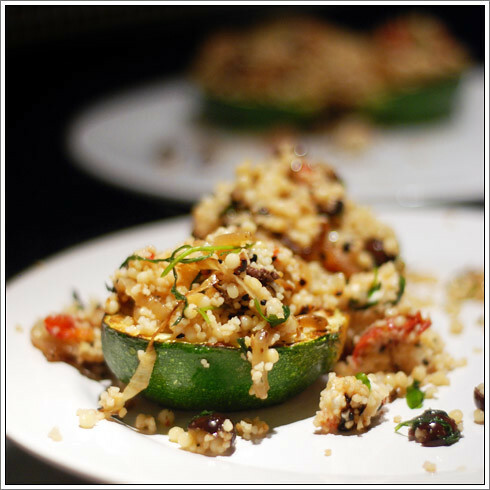 Place two courgette halves on each plate and then spoon over the cous cous. Enjoy!